I just had a bizarre experience. Following the announcement of election results in al-Qasr al-Eini district (Update: this is the district that includes Tahrir Sq. it’s the heart of Cairo … the epicenter) I was waiting to see what Gameela Ismail did. She lost to Muhammad Abu Hamid and Amr Khidr. I googled Abu Hamid’s name to see who he was (I was annoyed by his supporters who interrupted the announcement of over a minute to celebrate his +30,000 votes) and was blown away when I saw his picture. This man had a huge impact on me growing up. The role he played in my development is as significant as that of my current Nobel Laureate PhD advisor. The impact he had on my life (as an undergrad) was no less that that made by Prof. Ahmed el-Sharkawy back in Egypt . Prof. Ahmed el-Sharkway was the first person to allow me to work in a laboratory. He took me under his wing and supported me all the way; through being an URP at CSHL and until getting into Grad School. I visited him last summer in the same office where I met him for the first time. Muhammad Abu Hamid, or ‘Shiekh Hamid’ as we used to call him was my first religious mentor. Through him I was introduced to ‘circles of knowledge’. He is a top Quran teacher (in terms of licenses and technique) and built a huge Quran School in collaboration with al-Husary mosque. I loved him and was completely enamored by this new world of knowledge, when before I only knew science and the lab. He always struck me as a multi-tasker that stretches himself too thin but still delivers quality work. I recognize that a decade has elapsed since then. 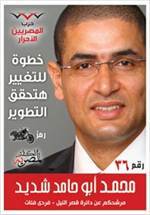 He is a founding member of al-Masryeen al-Ahrar (Free Egyptians) Party, which is a new liberal party. This is counter-intuitive to me. I’m interested in learning more about what happened during the past ten years.